The 2-in-1 knife and cutting board! 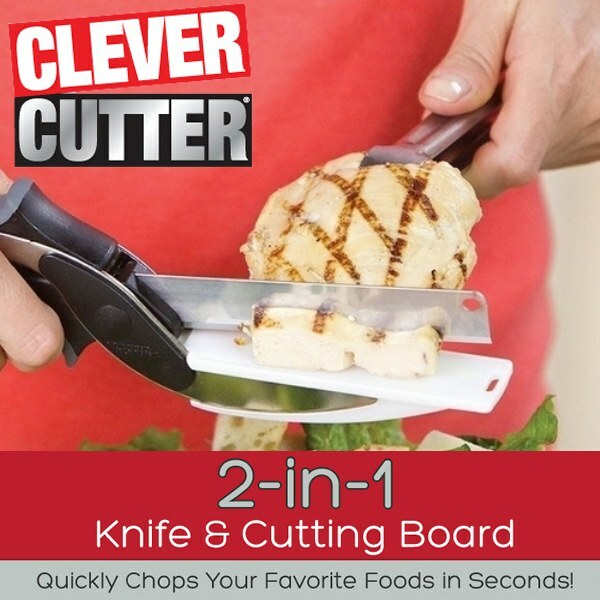 Clever Cutter is the revolutionary 2-in-1 knife and cutting board that chops and slices your favorite foods in seconds! The secret is the 2-in-1 clever design with ergonomic power pressure handle, to effortlessly cut through food fast! Clever Cutter&apos;s premium blade and extra wide mouth makes cutting fruits, veggies, meats and more fast, easy and mess-free. Gift for my husband. He loves it. Uses it all the time. Use it to cut whatever I can. Not as easy to use as was advertised on tv. Clever cutter it is. I can go with you more carrots with this than I can with a knife. Cuts great and a great multipurpose tool. A few things I have found it doesn&apos;t work quite as well as just a knife but for not things is a great convenience. I absolutely love this product! It saves me so much time. However, it&apos;s disappointing that they only let you get 3 per customer. I tried to order 2 extra ones for me for our camper and an extra one for at home, and 3 for each one of my daughters and it won&apos;t let me. I know they would just love this product too!